I mean I get it...but do I really GET IT? Can we respect this Cray Cray or is it just to Cray Cray? LOVE it! A little cray cray in a house is a good thing. Balances out all the blah. Looking beautiful interior design and decoration, i like it so much, would like to huge thanks to share about Interior Design Services. Thanks for Sharing. Well, at least there's an actual color scheme--it all looks deliberate, not haphazard, which usually makes it work in my book. Not that I would want it in my house...though I might take that rug! i think the lamp takes it one step too far. too matching purse and pumps from the eighties. i think without it - with a stooping brass number or sconces or anything else would minimize the crazy. A little cray isn't always bad. I don't hate it. cray cray...I tend to like a little more tailored look. It just kind of makes you feel like "what?" Instead of relaxed or "wow!" The lamp ruins it for me. Could be an amazing concept if it was a bunk house at a lake cabin. Sort of like they used all the good parts of those old plaid blankets and 'made do' with what they had, devil may care sort of look. Not sure I want it in my hypothetical lake cabin bunk house, but perhaps slightly toned down, it could be simply understated and beautiful while being in your face at the same time. And somehow, that last sentence makes complete sense to me. this works for me in the right context. 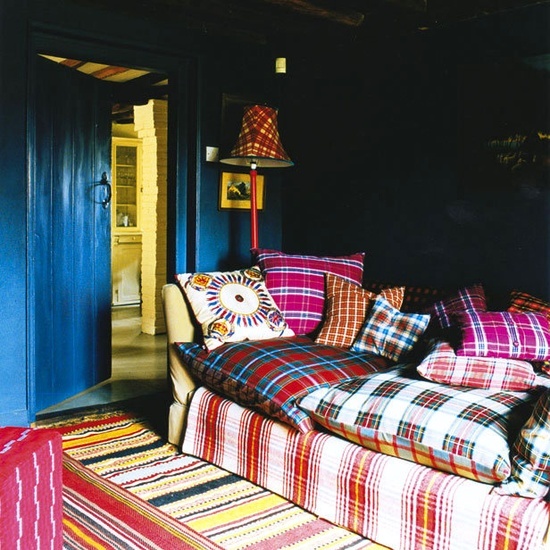 it would look all kindsa ghetto in my own house...but in a cozy english cottage? WIN. bad BAD cray cray! It bothers me and kind of stresses me out lol. And that is just the picture. Imagine if I actually went into the room. I do think I like the paint color though. Not sure if it's the lighting but it looks like a very pretty blue. Kind of the blue I want to paint my sons room in. Totally dig it. Throw in a disco ball and we're golden. Thanks for the inspiration! A bedroom makeover is high on my todo list for 2010 and I need lots of ideas to find something that would work for us. I kind of love it, but not as a main living area piece. It'd go well in a small-room-turned-cozy-study/reading-room, only with some (un)-matching ottomans. Cool post very informative. I just found your blog and read through a few posts although this is my first comment, i'll be including it in my favorites and visit again for sure. It’s true that some of the most striking interior design comes from completely redoing a space with new colors, furniture, and trimmings. Sometimes, however, a change that big is not needed. It may be that your room needs refreshing, rearranging, and a trained interior design eye. Here a great concept regarding to the interior design! if it was a bunk house at a lake cabin.perhaps slightly toned down, it could be simply understated and beautiful while being in your face at the same time. And somehow, that last sentence makes complete sense to me. This is very nice and informative post. I, personally, love the absurdity of this. We spend too much time trying to think about good interior design instead of just picking things we find pleasing to look at. Who really cares about how technically complimentary certain patterns and certain colors are. I like the way the rug pattern keeps everything connected as it is the only stable pattern there it. Everything else is bouncing off one another and the rug is the constant that ties into the stripes on the bottom portion of the couch. The eccentricity is what makes this for me. Love this pillows, More colors and more designs can gives us huge pleasure. It's the carpet that's just a bit overboard for me. If that bright of a couch was placed in a larger room, with neutral carpets and walls, I would be in favor. As is, it's just a bit too much. We conceptualize designs and perform renovation works for HDB, Condominium, Landed and Commercial projects of all sizes and budgets. nice and beautiful pattern. what is made from? sintetic wool? I think this is a very unique interior design. I think it looks really good. I like the different color on the pillows on the couch, and the blue walls and door really bring out the colors of the rest of the room. I would love to have a room like this in my house. Please visit my latest article about metal letters home decor. Wow really such a wonderful interior designs... This is one of the most colorful. Thanks for sharing. Well done site.., thanks for sharing and goodluck! Thanks for sharing such an informative blog . Very Nice Blog I Have Read Your Blog It Is Very Interesting And useful For Interior Designer Thank You For Posting and Sharing With Us And Please Give Me More Information About Luxury High End Interior Designer. Luxury High End Interior Designer. I can only say "beautiful and luxurious"! i like it! It's very useful information to us.Thank you. Nice Designs. Thanks for sharing. Nice Blog, Thanks For Sharing Information. Ifixit4u.in is a Ranchi-based mobile repairing service provider,instrumental in offering all sorts of fix and repair solutions at your doorsteps. We are offering the highest-quality repairing service as per the market standard at affordable retes. All Architectural Related Best Services contact us. I just take a peek and saw your blog. interior designing is not easy its a talent.